MATADOR is certainly one of the greatest “performance spread” bulls ever produced in our breeding program. His progeny are generally light birth weight and yet are one of the top sire groups for weaning, yearling and gain performance year after year. 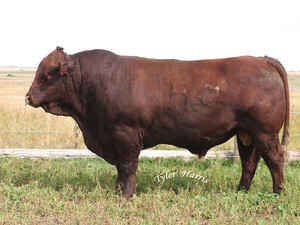 He is listed on the 2007 ASA Sire Summary as a Balanced Trait Leader. His progeny are long-sided and very thick made with impressive muscularity and outstanding gainability. His greatest contribution may be his daughters who feature tremendous volume, capacity and fleshing ability with plenty of milk and nicely designed udders.